THE intriguing question is which colour shirt Kyle Walker will wear when Spurs take on Manchester City in the third of their USA tour matches on July 29? As I type, City and Tottenham are playing hard ball over his fee, and the transfer transactions could be finalised in the States. There is a relaxed air in the Tottenham camp because in Kieran Trippier they have a ready-made replacement for Walker, and many consider his passing accuracy makes him preferable in the No 2 shirt. 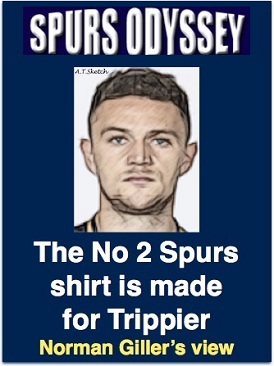 If the Walker-to-City move goes through the irony will not be lost on Trippier. The boy from Bury was rejected by City after captaining their Under-18s side to the FA Youth Cup. He had to learn his craft on loan with Barnsley, and then established himself as a quality act at Burnley. The Lancastrian arrived at Tottenham as understudy to Yorkshireman Walker but we have seen enough of him to know he will slip comfortably into the lead role. If the Walker deal goes through it will reignite their rivalry for the England right-back spot. Through all their Battle of the Roses, they have remained close pals off the pitch and will be wishing each other the best of luck wherever the football fates take them. Whether it is the oncoming football season that interests you, or other sports such as cricket or tennis, this latest Betfair bonus should be of interest. Why not check out the offers available? I have now counted 78 players who have been linked with Spurs since the close of the season, and the one rumour that persists is that Ross Barkley will eventually wind up at Tottenham after the usual Daniel Levy bartering and bargaining. But I will not believe it until I see him in a Spurs shirt. Here�s a picture to warm Tottenham hearts. 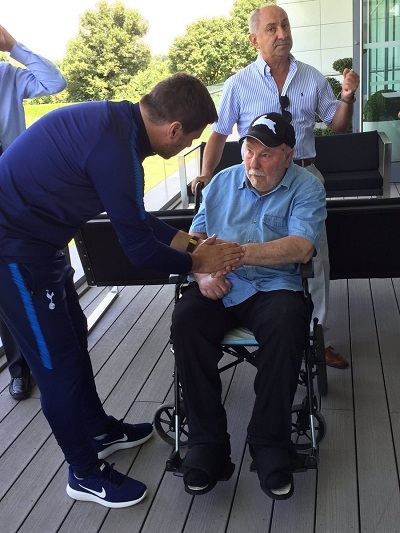 The all-time hero Jimmy Greaves with the modern king of Spurs, Mauricio Pochettino. Jimmy, wheelchair-bound after his stroke, made a hush-hush visit to the magnificent Tottenham training ground at Hotspur Way. He was in the friendly care of Legends Cliff Jones, Pat Jennings, Alan Gilzean and Ossie Ardiles. Mauricio, who knows his football history like a walking record book went out of his way to spend time chatting to Greavsie, who could not believe the super quality of the set-up at the training centre. Cliff, of course, was a key man in the Double year of 1960-61, and that is what we continue to focus on as we reach Part Six of our visit back to the greatest season in Tottenham�s history. On the 50th anniversary of the FA Cup victory over Leicester at Wembley, I combined with entrepreneur and life-long Spurs supporter Terry Baker to produce a limited edition book of the Golden Double, that was introduced and autographed by Braveheart Dave Mackay. CHRISTMAS EVE and Boxing Day home and away matches against West Ham gave Spurs the chance to cement their lead at the top of the table, which had now stretched to an overwhelming ten points. The Hammers, their attack led by Tottenham old boy Dave Dunmore, battled bravely at The Lane but went down to two headed goals � the first by John White in the 28th minute and the second in the closing moments of the game by Terry Dyson. The 65,930 crowd was the biggest of the season. Remarkably, the goals from White and Dyson meant that every Spurs forward had reached double figures in the League with the season not even halfway through. The scoring tally was: Bobby Smith (18 goals), Les Allen (12), Cliff Jones, John White and Terry Dyson ten goals each. And they said the Dutch invented Total football! In all, Tottenham had amassed 73 goals. Their gung-ho attacking methods came at the price of something of a leaking defence � with 22 goals conceded. Danny Blanchflower gave little heed to defensive duties, which meant that Peter Baker had to work hard to cover for him. But proof that Danny�s attacking attitude was a key factor is that many of the goals scored had a pass from Danny stitched into the build-up. West Ham, in a transitional period before the emergence of youngsters Geoff Hurst and Martin Peters to join Bobby Moore, played some neat, thoughtful football, but without causing goalkeeper Bill Brown too many problems. There was less pressure on the Hammers when Cliff Jones limped out of the game on the hour with damaged ligaments, this of course in the pre-substitute days. QUOTE � Bill Nicholson: "Considering we had Cliff Jones injured inside the first minute of the second-half and Bill Brown handicapped by a swollen ankle, we have to feel satisfied with our performance. We have developed an excellent team spirit, and there are no prima donnas. All the players are dedicated to the team effort." TEAM AND SCORERS: Brown, Baker, Henry; Blanchflower, Norman, Mackay; Jones, White, Smith, Allen, Dyson. PERHAPS West Ham had more Christmas pudding than the Tottenham players; whatever it was, they were almost completely outplayed in the return match at Upton Park. The final scoreline flattered the Hammers, who had to work their socks off to avoid being humiliated. For the first time in the season, manager Bill Nicholson was forced to make two changes: John Hollowbread taking over in goal from Bill Brown, and Terry Medwin coming in for Cliff Jones. Centre-half Ken Brown conceded West Ham�s first goal, turning the ball into his own net as he tried to divert a Les Allen shot. Allen did not need any help with the second goal, making it 2-0 after controlling a paralysing pass from Dave Mackay. Allen and Brown had grown up together in Bolland Road, Dagenham, but their friendship was put on hold for 90 minutes. West Ham, with Welsh international Phil Woosnam pulling the strings in midfield, made a bright start to the second-half, and 19-year-old Bobby Moore was ready to celebrate a rare goal when Hollowbread leapt high to pluck the net-bound shot out of the air. The match-clinching third goal was a thing of beauty that had even West Ham fans applauding in appreciation. The ball travelled on a magic carpet of 13 ground passes before John White finished the magnificent move with an angled shot that gave goalkeeper Brian Rhodes no chance. Bookmakers were now refusing to take bets on Tottenham winning the League championship. Wolves were back in second place but ten points adrift of the unstoppable Lilywhites. QUOTE � Danny Blanchflower: "Bill Nicholson is never an easy man to please, but even he had to admit that at times in this match against West Ham we touched Everest-peaks of perfection." TEAM AND SCORERS: Hollowbread, Baker, Henry; Blanchflower, Norman, Mackay; Medwin, White, Smith, Allen, Dyson. Scorers: Brown (own goal), White, Allen. TOTTENHAM rang out the old year with a resounding victory over Blackburn Rovers on an almost spring-like day at The Lane. Even without injured Spurs braveheart Dave Mackay, Tottenham bossed the midfield after England winger Bryan Douglas fired Rovers into a 1-0 lead completely against the run of play in the 14th minute. Bobby Smith chested an equaliser from a Terry Dyson cross in the 37th minute, and then � with Tony Marchi fitting comfortably into the Mackay shirt � Tottenham took command. They ripped Blackburn apart with a series of rapid raids in the second-half, and collected four goals in a 20-minute burst of brilliance. Les Allen volleyed the ball into the Blackburn net in the 57th minute, and two minutes later skipper Blanchflower swept the ball home after running on to a neat back-heel from Bobby Smith. Allen and Smith made it 5-1 before Peter Dobing replied with a late goal for shell-shocked Rovers. Much to the undisguised annoyance of Bill Nicholson, all the talk as 1960 gave way to 1961 was of whether Spurs could go on to win the elusive double of League championship and FA Cup. They came into the New Year with a ten point lead over Wolves, and so the first leg of the Double � the League title � was almost certainly already wrapped up. TEAM AND SCORERS: Brown, Baker, Henry; Blanchflower, Norman, Marchi; Jones, White, Smith, Allen, Dyson. Goalscorers: Smith (2), Allen (2), Blanchflower. THE FA Cup adventure started with a home third round tie against Charlton Athletic as a revolution loomed on the football horizon. For all their success in this 1960-61 season, the Tottenham players were being paid the �20 maximum wage � earning exactly the same as the footballers at Accrington Stanley down in the Fourth Division. PFA chairman Jimmy Hill announced that the players had agreed, controversially, on a nationwide footballers� strike on January 21. Charlton, dreaming of Wembley from a mid-table position in the Second Division, gave an excellent account of themselves after going two goals down inside the first 30 minutes. The goals were like carbon copies, Danny Blanchflower slicing the defence apart with measured passes that Les Allen steered into the Charlton net. Skipper Stuart Leary, Charlton�s South African-born Kent cricketer, pulled a goal back in the 33rd minute, but Terry Dyson quickly restored the two-goal lead and once again it was a pass from the imperious Blanchflower that created the chance. The second-half was barely a minute old when Sam Lawrie snatched a goal for Charlton that brought sudden tension to a game Tottenham had been monopolising with ease. Just as it seemed inevitable that Charlton would force an equaliser and earn a replay, it was that man Blanchflower who took command in midfield and slowed the frantic pace of the game, which took the sting out of the Charlton comeback. QUOTE � Dave Mackay: "Charlton showed just why we must not take any match for granted. People think it's so easy for us because of our record this season, but there is no such thing as an easy game. We must not lose our concentration and determination." TEAM AND SCORERS: Brown, Baker, Henry; Blanchflower, Norman, Mackay; Jones, White, Smith, Allen, Dyson. Goalscorers: Allen (2), Dyson. TO a backdrop of the news that the Football League hierarchy had capitulated and agreed to the kicking out of the maximum wage, the Manchester United players celebrated by handing Tottenham their second defeat of the season. Spurs would not seek to make excuses as, without argument, the better side won on the day, but they lacked their usual rhythm because of injury-forced team changes. For the first time, they failed to find the back of the net. Peter Baker, Cliff Jones and Terry Medwin were all sidelined for a game switched to the Monday evening after fog caused a postponement on the Saturday. Welshman Ken Barton came in for his League debut at right-back, and John Smith filled in for Terry Medwin. Smith had joined Spurs from West Ham, with Dave Dunmore moving as part of the deal. The idea was that he would eventually replace the ageing Danny Blanchflower, but Danny Boy had no intention of stepping down! It was 18-year-old Nobby Stiles who gave United the lead in the 13th minute, but you would have got good odds on Tottenham coming back into the match when United goalkeeper Harry Gregg went off with a damaged shoulder a minute before half-time. Centre-forward Alex Dawson took over in goal and pulled off a series of unlikely saves � applauded by Gregg, who had come back on the pitch heavily strapped and playing a nuisance role in attack. It was Gregg�s cheeky back heel that set up a victory-clinchng goal for Mark Pearson in the 74th minute. QUOTE � Harry Gregg: "I have always told the other players that playing up front is easy compared with keeping goal. I thoroughly enjoyed myself, and loved playing a part in the crucial second goal. But let�s not take anything away from Spurs. They are exceptional." TEAM AND SCORERS: Brown, Barton, Henry; Blanchflower, Norman, Mackay; J. Smith, White, R. Smith, Allen, Dyson. Join us here again next week for the seventh instalment in our journey back to the greatest season in Tottenham�s history. Each week during the close season, I am setting a weekly Tottenham teaser, just for fun and to keep you thinking about the club�s great history. Last week I asked: Which French-born defender played exactly 200 League and cup games for Spurs between 2006 and 2015, and made his 24th and last international appearance in the 2014 World Cup finals � but not playing for the country of his birth? Yes, the skilled yet eccentric left-back Benoit Assou Ekotto, who was born in France but chose to play for his father�s country Cameroon. His eccentricity went a step too far when he was banned from international football for head butting a team-mate during the 2014 World Cup finals. Benny was never ever dull. First name drawn from the correct answers was Joe Anderson, from Guildford who has been a Spurs supporter for 30 years. I will send Joe a screen version of my Spurs �67 book (you might consider buying a signed copy from me at http://www.normangillerbooks.com � all profits to the Tottenham Tribute Trust to help our old heroes). This week�s teaser: Which 51-cap international striker was � at 37 � the oldest outfield player to appear in a Premier League match for Spurs? Email your answer please to SOQLTeaser10@normangillerbooks.com Closing date: midnight this Friday. I will send a screen version of Spurs �67 to the first name drawn from the correct answers. Thanks for your company. See you same time, same place next week. COYS!